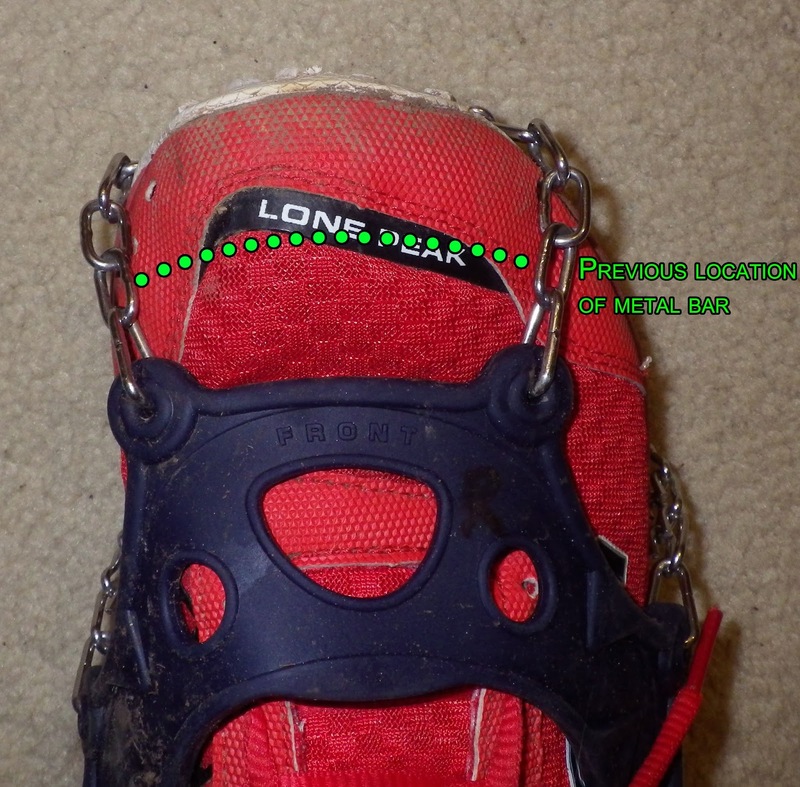 You may have read about the issues I was having with my new Hillsound Trail Crampon Ultras staying in place on my Altra shoes in my recent gear review blog post. The problems I was having included: 1) the toe not staying in place and the toe-bar pressing in, 2) heel spikes not secure enough and 3) sides of upper rubber rolling upwards when tightened. I have now made some modifications to them and have solved numbers 1 and 2 above. Issue 3 is still a problem, but it's one I can live with. To allay any suggestions that I'm simply using the wrong size, I tried a medium pair as well and the rubber upper was too tight for my foot, plus the toe-bar issue was worse. An extra-large would have made issue 2 worse. Previous location of the metal bar shown in green above. New location of metal bar on R foot. Notice it's not symmetric. 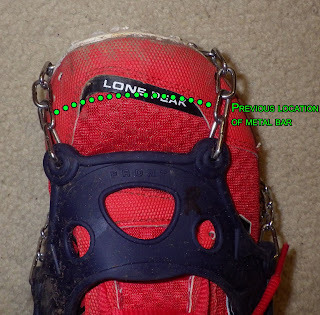 In regards to issue 1 above, I moved the front metal toe-bar from the top of the foot to the bottom of the foot. This wasn't all that easy since the metal is quite strong. I ended up having to use vice-grips and a small screwdriver to pry the loop closure open. Once unhooked it was easy to reposition and squeeze together the loop where I wanted it. The positioning of the bar is no longer symmetric (see the second image) as I wanted a perfect fit and that was the only way to get it. If you are trying this, be careful not to bend it too far as the metal may be on the brittle side. 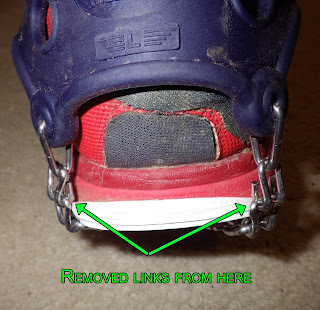 I realize the purpose of the toe-bar was probably to keep the two front chains from moving too far to the side of the foot and allowing the shoe to slide forward, but in my experience they were doing this a little too well. The modification now allows the front chains to spread apart slightly more than before, while still keeping the foot from sliding forward.You can see this change in the pictures on the right. The second issue of the heel spikes/chains being somewhat looser than ideal was solved by removing a chain link from both of the heel chains. This was even more difficult than the toe-bar modification as it required bending of 4 loops for each link I removed. Again, these links seem quite brittle. This isn't a bad thing given their need for strength, but it does make modification somewhat risky! I still haven't come up with a way of fixing the third problem. It will have to be something that gets fixed with future generations of this product. So, despite my complaints and the need to make some modifications to the toe-bar and the heel chains, I still really like these. Their traction is fantastic, and they're super light! Highly recommended!